Australia's Google Cloud Platform region has arrived. Customers can now run their workloads and store data in Sydney. The Sydney region is now open. 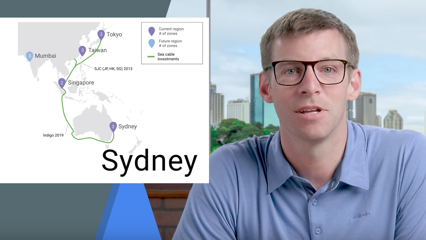 You can now select Sydney as a GCP region, enabling Australia, New Zealand and surrounding area users to use compute, big data, networking and storage more close to home. Our performance testing shows 80%-95% reductions in RTT latency when serving customers down-under, compared to using Singapore, Taiwan and Tokyo regions. See our announcement blog post. The Sydney region has 3 zones. Developers and network admins can distribute apps and storage across multiple zones to protect against service disruptions. "The biggest advantage for us as a business is that Google Cloud Platform (GCP) is a modern platform and a modern way of thinking. In addition, when we delved into the specifics of services such as BigQuery, we found they were market leaders in terms of functionality and performance. GCP has given us the confidence to build our business and work with high calibre partners and we look forward to continue working with Google to expand into new markets in the future." "The new Google Cloud Platform (GCP) Region would provide a wealth of opportunities for private and public agencies alike. So we can continue to provide excellence in customer service and better value for taxpayers, we are continuing to look for new and more innovative ways to work. Google's web-first approach has meant we have been able to easily rollout technologies such as G Suite quickly and seamlessly across our business, improving customer facing assets like our Self Service platform. Our early access to Google's Cloud Platform has allowed us to demonstrate the value it could add to our business, and we are excited at the potential opportunities presented by the new GCP Region offering." "Fairfax is excited to see the launch of the Australian Google Cloud Platform region, providing a leading set of capabilities in-region. Google's depth of engineering excellence in the big data and machine learning space is a particular area of interest for us, as we look to innovate in the media domain. This launch is a sign of Google's commitment to innovation in the Australian cloud computing market and will allow Fairfax to grow and invest further in GCP." "The regional expansion of Google Cloud Platform to Australia will help enable PwC's rapidly growing need to experiment and innovate and will further extend our work with Google Cloud. It not only provides a reliable and resilient platform that can support our firm's core technology needs, it also makes available to us, GCP's market leading technologies and capabilities to support the unprecedented demand of our diverse and evolving business." "Monash University has one of the most ambitious digital transformation agendas in tertiary education. We're executing our strategy at pace and needed a platform which would give us the scale, flexibility and functionality to respond rapidly to our development and processing needs. Google Cloud Platform (GCP) and in particular App Engine have been a great combination for us and we're very excited at the results we're getting. Having Google Cloud Platform hosted now in Australia is a big bonus." "Modern geophysical technologies place a huge demand on supercomputing resources. Woodside utilises Google Cloud as an on-demand solution for our large computing requirements. This has allowed us to push technological boundaries and dramatically reduce turnaround time." Download this whitepaper for a look under the hood of Google's global scale technical infrastructure. Learn, with explicit detail, how your data is secured through the entire information processing lifecycle. Download this whitepaper from MIT on how today's businesses are reaping the benefits of ROI and competitive advantage through embracing machine learning on their data sets. Google Cloud Platform partners in Australia are available to help design and support your deployment, migration and maintenance needs. Learn from Google's engineering experts on how the modern enterprise is benefiting from the latest in Cloud technology. Topics include "Introduction to GCP" through to "Overview on Machine Learning". Telegraph Media Group uses GCP as its enterprise data warehouse to gain insights about its existing and potential subscriber base. BNP Paribas Fortis uses Google App Engine for fast hosting and upscaling from one to multiple departments, without the need to configure servers, hard disks, or networks. Ocado has saved on IT operations costs and headcount, compared to implementing additional services within its own data centers. Shazam uses GCP for rapid auto-scaling on Compute Engine, allowing them to respond to spikes when they occur.